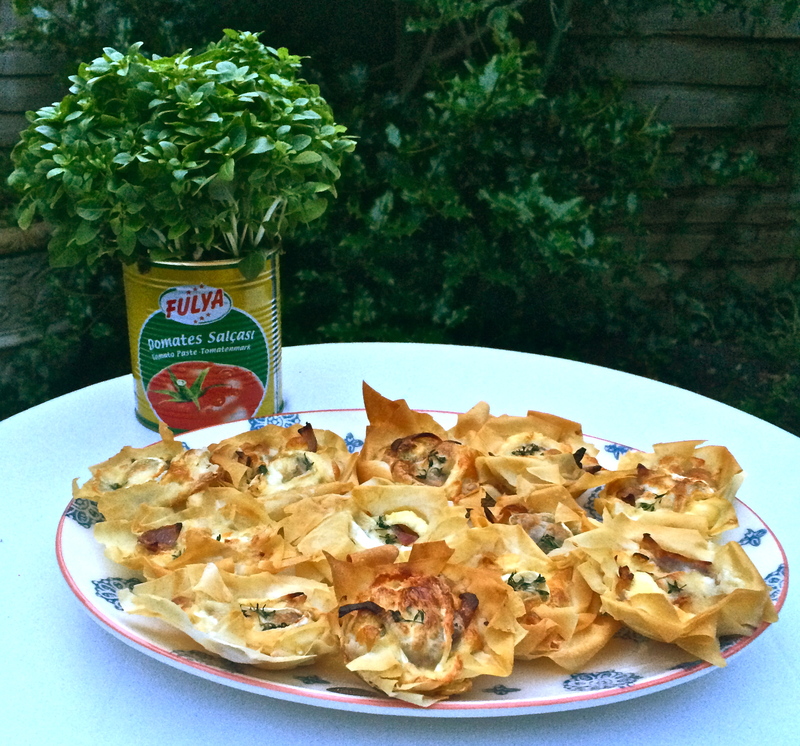 Filo pastry tartlets make the easiest bite size canapés, perfect if you are putting on some drinks and nibbles. You can put pretty much anything you want in them, but goats cheese and red onion always works pretty well together. Start by brushing a muffin tray with a thin layer of olive oil. Then lie out your sheets of filo and cut into triangular pieces. Lay them on top of each other in the tray at angles to create little crumpled cases, brushing each layer with a little olive oil as you go. 3 triangles per case should do it. Chop up the red onions, and pop them in a pan on a low heat with the olive oil, butter and sugar, and leave to caramelise for a good 20 minutes until golden. Once done, evening distribute the onions between the cases, put a thin slice of goats cheese on top and top up with the egg mixture. Place a small sprig of thyme on each one. Slide into the oven for 15-20 minutes until they have gone all golden and crispy. And there you have it! Delicious bite size canapés perfect for a summer get-together.